This sliced roasted potatoes in oven makes an easy side dish or snack or you can use them to make a very simple, quick and delicious potato salad which is free from mayo. 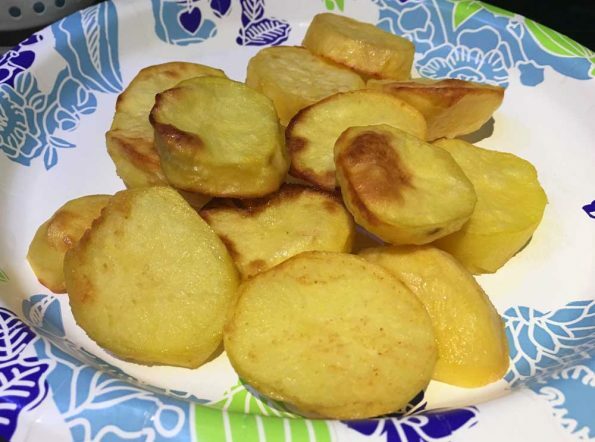 This recipe for roasted potato slices is vegetarian as well as vegan. You can make very simple potato salad using these simple, sliced roasted potatoes flavored with olive oil, lemon juice, salt and olive, and you may tweak the flavors by adding your favorite spices and flavors according to your liking. 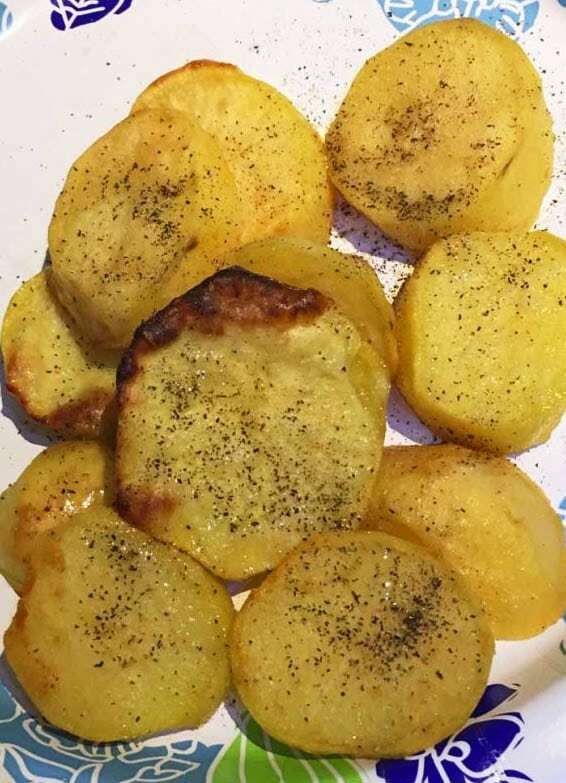 This super easy oven roasted potato slices is very delicious and filling as well, I just enjoyed it as my lunch. 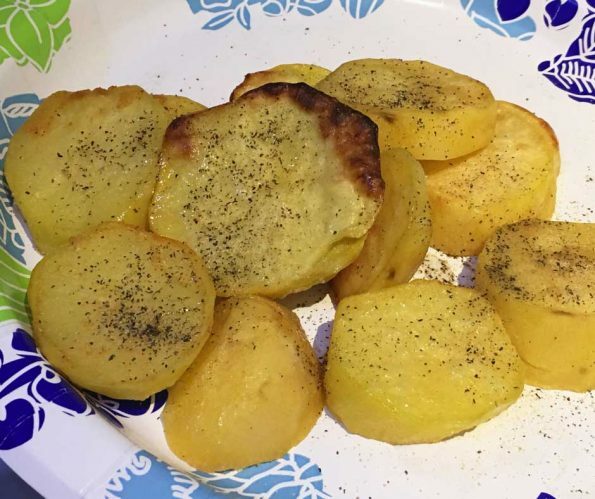 Many of the vegetarian or vegan salads are really not very filling for me, especially if I am trying to replace it for a full meal for lunch or dinner, but potatoes salads are always very much filling and delicious and you can use these sliced roasted potatoes in oven to make simple and filling potato salads at home. And you won’t feel missing the mayo or cheese in these potato salads as they are already delicious with the roasted flavors and mild flavorings that you can add. See my posts on lettuce tomato salad recipe here and watermelon salad recipe here if you like simple and easy salad recipes with fewer ingredients. Cheesy potatoes are definitely delicious but if you want to make a delicious potato salad without cheese or mayo, this oven roasted potato slices is perfect to be used in the salad. We only need very few ingredients to make potato salad using the sliced oven roasted potatoes, as we just need potatoes, salt, a few spices and a little oil and lemon juice. And this is so easy to make too. I peeled the potatoes but you can leave the skin if you want to. The only hard part is to peel the potatoes but if you use a good quality potato peeler, peeling potatoes is not a job anymore. In fact, I use this peeler not just for peeling potatoes but also for peeling other vegetables like carrots, cucumbers, zucchini etc. 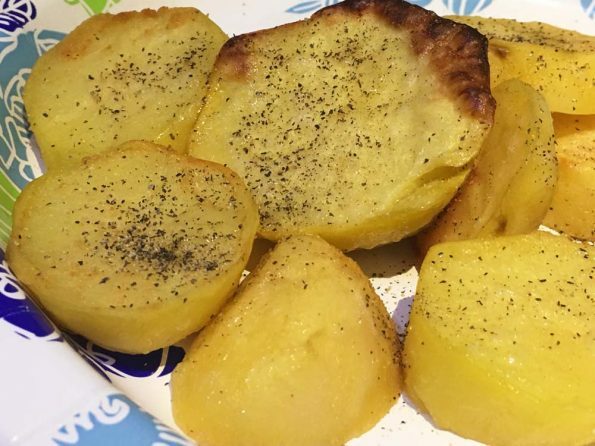 So here is how you can make this easy, delicious sliced roasted potatoes following this super easy recipe for oven roasted potatoes. Peel the potatoes and roughly slice to make thick round slices. Transfer the sliced potatoes to a large bowl and add garlic powder, black pepper, salt and oil. Mix everything well so as to coat the potato slices in garlic, pepper, salt and oil, let it marinate for about 15 minutes. Grease a large baking sheet with some oil and layer the sliced potatoes in a single layer. Bake for about 25 minutes or until the potato slices are roasted and browned. 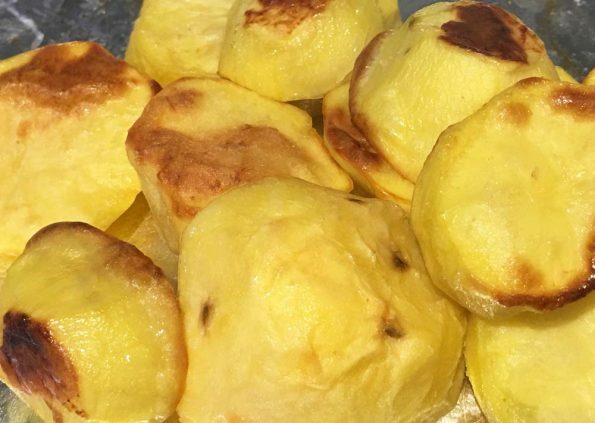 Once the roasted potatoes are transferred from the oven, wait until the potatoes are slightly cooled, and transfer the roasted slices to a salad bowl or plate while they are still warm. 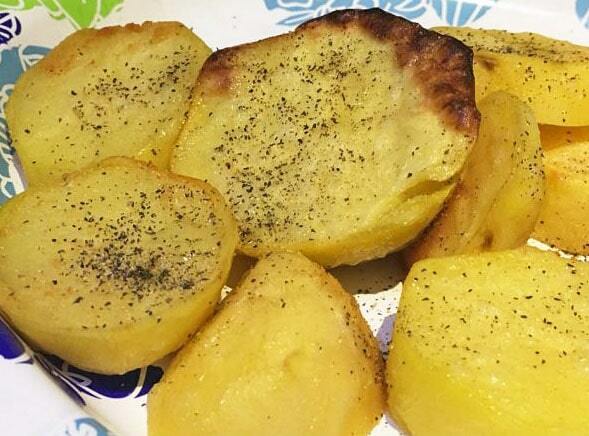 Sprinkle the oven roasted potatoes with black pepper powder and also add olive oil and lemon juice for dressing and mix everything well until the slices are well coated in the simple and yummy dressing. You may also prepare the salad dressing first by combining the lemon juice, olive oil and also black pepper powder in the salad bowl and then add the potato slices and toss them well so as to coat with the dressing. Serve the potato salad for lunch or dinner or you can also use it as a side or snack! Notes: The oven roasted potato salad tastes best while it is still hot. Once it is cool, you can warm up in the microwave for a few seconds before serving. Hope you found this post on easy oven roasted potato salad recipe helpful!